Sri Lanka’s wartime army chief says his conscience is clear and he would welcome a war crimes investigation to prove his innocence. In May 2009 the then General Fonseka was the head of the Sri Lankan army that defeated the Tamil Tigers, or Liberation Tigers of Tamil Eelam, ending Sri Lanka’s brutal 26-year civil war. Nearly two years later, a UN secretary general’s panel of experts reported that both government forces and the Tamil Tigers had potentially committed serious human rights violations in the final stages of the war. Shocking footage of the war’s end emerged shortly after, suggesting widespread crimes had been committed by forces under Fonseka’s command. While accepting that some crimes occurred during the war, Fonseka insists that these were acts of individual offenders, and not systematic. “The army as a whole, I can give the assurance that we never committed war crimes,” he said. To his supporters, Fonseka is a war hero. But to others he is a war criminal. He insists he has a clean conscience. In 2010 Fonseka unsuccessfully contested presidential elections against his former boss, Mahinda Rajapaksa. Speaking to the Guardian in Sri Lanka’s capital, Colombo, Fonseka claimed the former president and his family had acted like dictators after their 2010 victory. “Rajapaksa’s conduct was not acceptable to this country, especially after we finished the war,” he said. “He and his brother – secretary of defence – his whole family, his children, his wife, everybody was trying to behave like a king here; they were behaving like dictators. In 2010 Rajapaksa stripped Fonseka of his military rank and decorations. The following year Fonseka was jailed for suggesting that the president’s brother, the defence secretary, Gotabaya Rajapaksa, had ordered Tamil Tiger leaders to be killed as they surrendered. The Rajapaksas have denied any wrongdoing during the conflict. 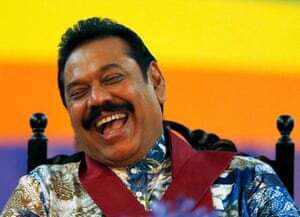 In January 2015 Rajapaksa, who had won two consecutive terms as president, suffered a surprise defeat at the ballot box at the hand of a broad coalition of civil society and political powerbrokers. The winning candidate, Maithripala Sirisena, had been Rajapaksa’s health minister and the secretary general of his party, the Sri Lanka Freedom party. The main opposition party, the United National party, as well as former president Chandrika Kumaratunga (herself a Sri Lanka Freedom party member), influential Buddhist monks, and the leadership of the Tamil and Muslim minorities supported Sirisena’s candidacy. Votes from the island nation’s religious and ethnic minority groups were key to his victory. The new president vowed to implement widespread reforms within 100 days of his election, including transferring powers away from the president to the parliament. But he has had difficulty delivering his pledges. The UN human rights council delayed the release of its report on humanitarian crimes during the civil war to give more time to the new administration. There have long been calls for Sri Lanka to allow a full international investigation, but Sirisena promised only a domestic inquiry into wartime human rights violations. Last week the government announced the inquiry would begin in June. While observers say there have been some positive developments in public accountability, including a reform package passed last month by the Sri Lankan parliament, concerns about human rights remain. Sirisena’s appointment as army chief of Major General Jagath Dias, who led an army division linked to war crimes in the final months of the war, is worrying,according to Human Rights Watch. The new government, the result of a fragile cross-party political compromise, is negotiating a delicate path, seeking to fulfil the aspirations of the minorities whose support helped bring it to power while also retaining support among the majority Sinhalese community. Despite his electoral defeat, the arrest of one of his brothers, and ongoingcorruption investigations into another, Rajapaksa remains a political force in the south where he is positioning to run for prime minister on a wave of Sinhalese nationalism in forthcoming parliamentary elections.